Thankfully, we can specialize the progress bar widget for this purpose. 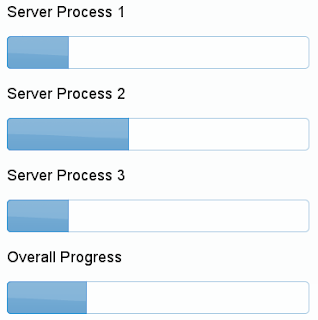 We can create a progress bar that observes a set of other progress bars to measure and display the overall progress. Here is an example of how we might go about doing this. Here we create four progress bar widgets. The first three are server processes that we want to show the progress of. The fourth progress bar uses a custom progress bar widget that we'll show below. Here, we set a timer that will update the three server precesses. The progress bar widgets are in turn updated. The overallprogress widget takes a subject parameter when it is created. The subject is observed by the overall progress widget. In our example, it is passed a jQuery object containing the three regular progress bar widgets. It then listens for progressbarchange events, on which, it updates the overall progress.